- cod. 5427.96.04 per Yamaha R6 600 2008/2010 È inoltre disponibile la trasmissione filo gas universale cod. 5430.96.04. Domino raccomanda l’utilizzo del comando gas XM2 unicamente per l’uso in pista o strade chiuse al traffico. 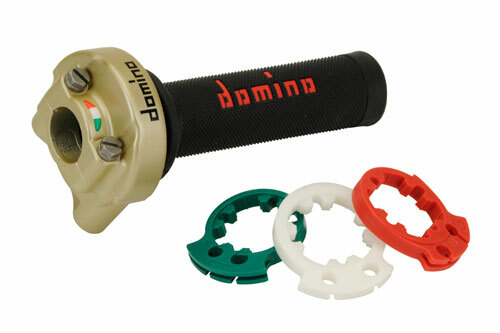 Domino introduces the version of XM2 throttle control with gold painted body, suitable for the most famous sports bikes. Developed in cooperation with Moto2 best teams, like the present version with black body, it is a throttle control in light aluminium alloy with the peculiarity of the titanium bolts and screws granting lightness and holding. It is supplied with 3 rings with the following specifications: the white ring with 55° opening for a normal riding, the red ring with 53° progressive opening for a spo rting riding and the green ring with 60°opening for a riding on the wet ground. The universal throttle cable set ref. 5430.96.04 is available too. Domino recommends the use of the XM2 throttle control on the tracks and private roads closed to traffic only.